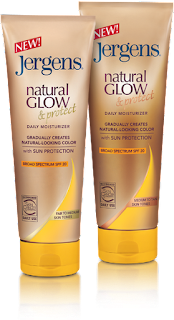 I don't know what's taken them so long, but Jergens is finally coming out with a broad-spectrum SPF 20 version of its über popular Natural Glow moisturizer. 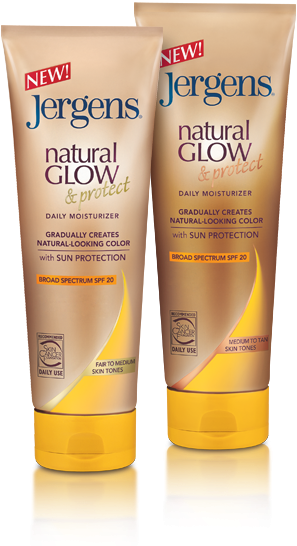 In my opinion, Jergens Natural Glow has revolutionized the way we think about self-tanning products. Self tanners, which use a harmless chemical called DHA to temporarily darken the top layer of your skin, are notoriously smelly and streaky. Jergens products are meant to be used daily, so they deposit just a small amount of DHA with every use. As a result, your "tan" builds gradually. Good news for those of us who have a tendency to stain our palms and look like we have a contagious skin condition when we use a more potent version. I'm super excited to try this new "protect" version when it debuts in stores at the end of March. I'll let you know how I like it. Seriously, though, Jergens--what took you guys so long? P.S. If you're a sucker for contests like me, sign up to win a free bottle on the Jergens Facebook page.